On Saturday when I should have been doing about a million other things, I decided to make scarves. Don't ask why. It was 70 degrees outside. Sometimes you just have to go with it. I made one for my daughter first out of some knit fabric I had in my stash. 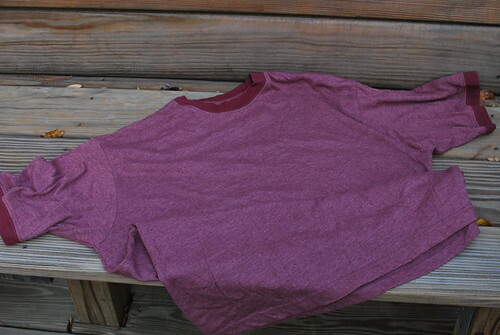 I wanted something lightweight, easy, and very washable. 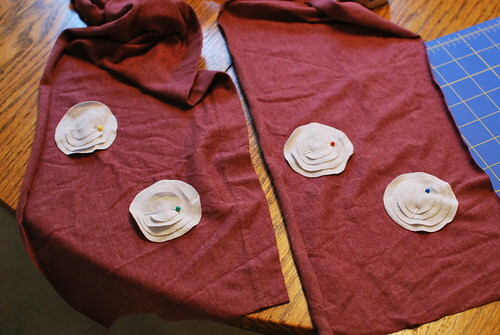 I cut the flowers out of an old t-shirt and leggings of my daughters that were stained. I stitched around the whole in the middle of the flowers to attach them to the scarf. I know the frowny face is just pitiful, huh? Then I made my son a scarf using some fleece also from my stash. He even helped me cut the fringe. Sorry I forgot to take photos. Then I decided I needed a scarf too. I wanted a lightweight one like Harper's, but couldn't find anything in my stash that I thought would work. So I went digging through my pile of old clothes that have been set aside for the perfect project. I found a t-shirt. It was a nice color and large enough for a scarf. So I decided I would make my scarf using this t-shirt. I even remembered to take photos so that I could share with you. Here's the t-shirt inside. Sorry the lighting wasn't very good. 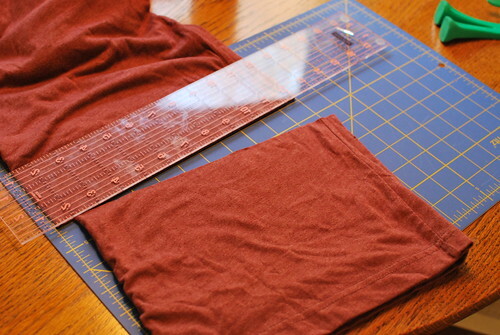 Fold the t-shirt in half and make a cut 8 inches from the bottom hem. 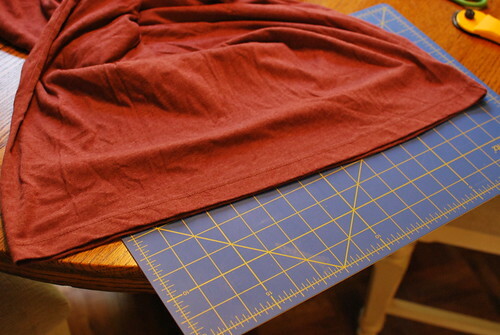 I decided to keep the bottom hem on, but you can always cut it off. 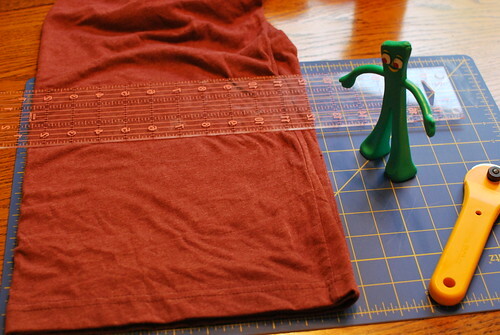 Gumby also stopped by to help me with my scarf. He agrees that 8 inches is a good width. Go ahead and make the cut. Sorry about that Gumby. 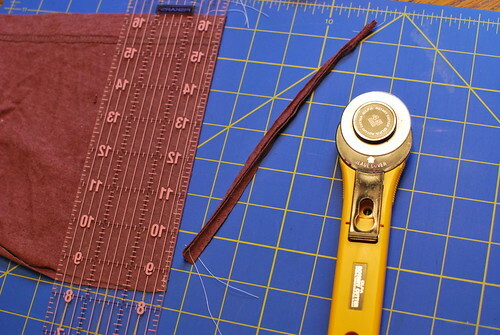 Trim the side seam. 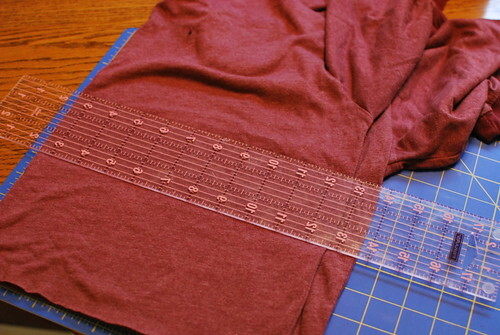 Now you have one long piece that is the length of the front and back of the t-shirt. 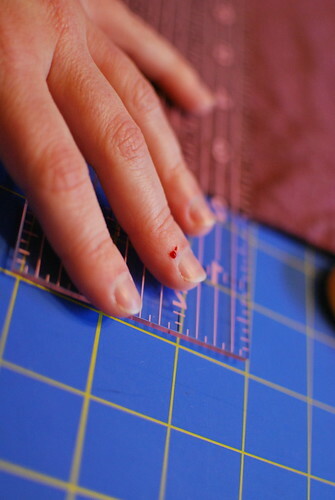 Cut another piece 8 inches from the bottom just like you did the first piece. Cut with caution. Rotary cutters are sharp. Ouch. 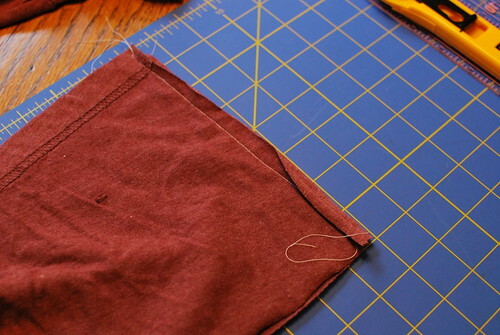 Trim the side seam of the second piece. Now you have two pieces that are the exact same size. 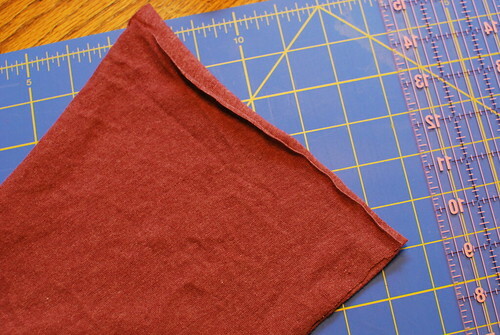 Put the pieces right sides together and sew one short end together. Trim it up if you need to. Now you have one very long scarf. 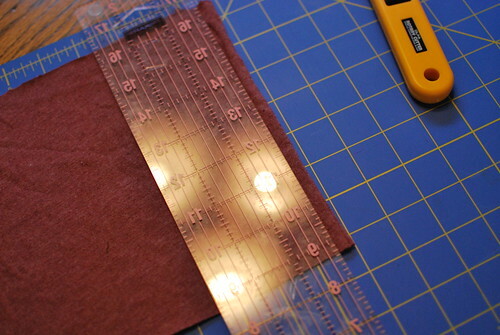 When you stretch it out a little bit the knit fabric rolls at the edges. At least that is what mine did. I left the edges raw. 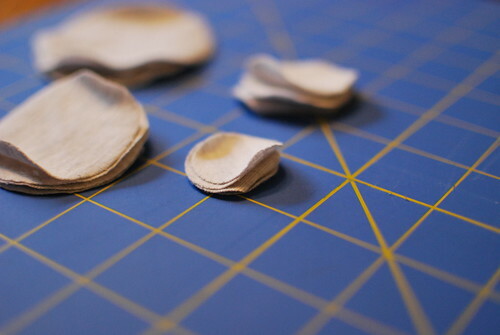 Now it's time to embellish if that tickles your fancy. 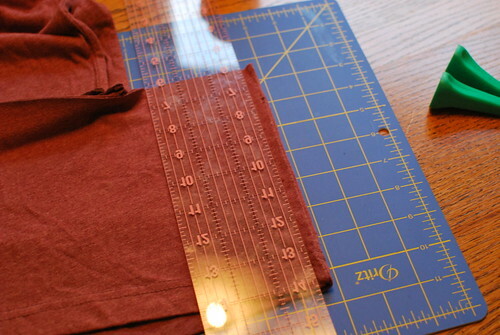 I cut several different sizes of circles from another t-shirt. 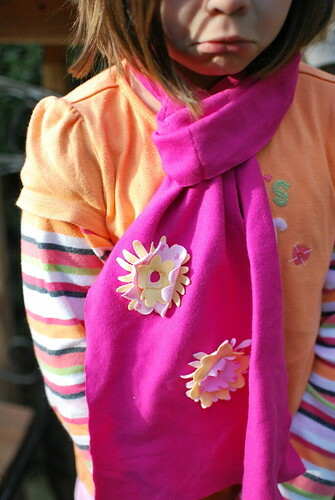 I layered them together to form flowers and pinned them to the scarf. 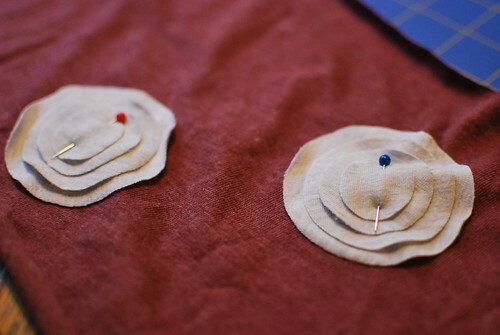 I just stitched a line through the smallest circle to attach it to the scarf. I am not sure how I like the flowers. 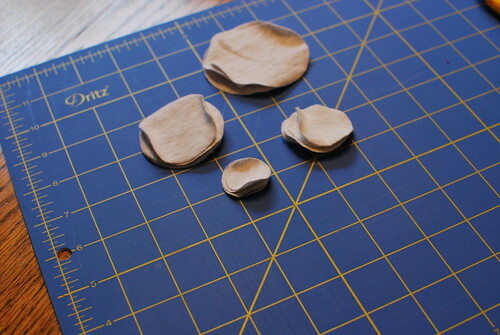 I think I will probably go back and just have them on one side and add a couple more, but you get the idea. It would look great with no embellishment too. 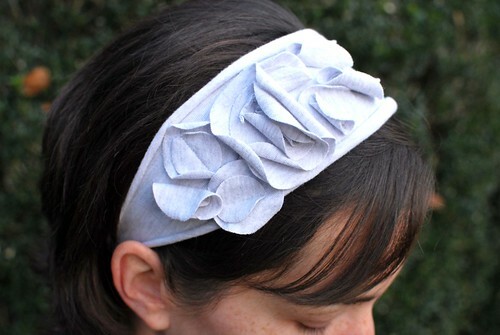 I used the same method for the flowers on this headband and think it looks better with more flowers. 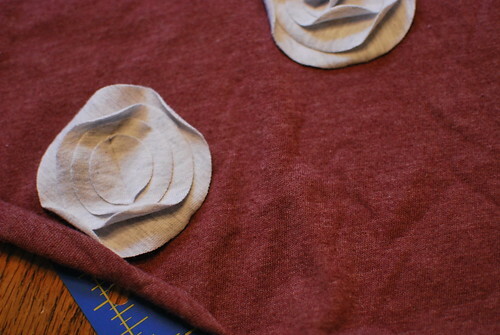 I stitched the lines in different directions to make the flowers curl in different directions. Let me know if anyone else decides to make one. I would love to see it. I am lovin' this idea. I need to start saving some of my old clothes. I have been on a huge consignment fed. After the holiday I am gonna rummage through stuff. Have a Happy Turkey Day. Going to the thrift stores this AM! We have been on a roll over here and it feels so good to not be "buying" new things! I love the scarf, it looks so comfy....I think I would tie-dye it, that would look awesome! I love stopping by your blog. You always have such great ideas and you inspire me to recycle more things into what I create. The scarves are beautiful and you're daughter's expression is hilarious! Hope you guys have a hood holiday! OOOH! Thanks! You are really inspiring. I've been saving all of Addie's stuff that is too stained to giveaway or wear anymore, I'm determined to start using what I can! I hope you all have a great Thanksgiving! We'll catch you later. Wow you have some cool ideas! 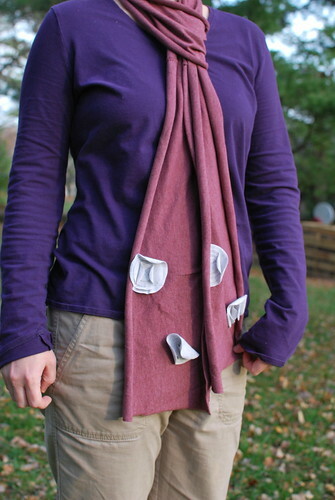 I would never have thought of making a scarf out of an old T shirt! The headband looks very effective too!